New figures released have shown that an increasing percentage of UK road users are turning to scooters for their preferred mode of transport. As well as being a fast and convenient choice of travel, scooters offer a more financially beneficial alternative to cars, in times of recession. As well as using less fuel, an area of much dismay for British drivers, scooters often cost less to insure. However, as more and more people look into the advantages of having two wheels rather than four, there are some important elements to be aware of to ensure costs are kept to a minimum. Not everyone is aware but whether or not your scooter is used or kept locked away in a garage, it is mandatory to have insurance. Previously, an offence was only caused if a person was caught driving a vehicle without cover. However, since the new Continuous Insurance Enforcement legislation was introduced last year, owners of any vehicle not insured are liable for fines of a possible £1,000 even if these are not used. Anyone in ownership of but not planning on using a scooter would be well advised to make sure they declare it as off the road as soon as possible. A SORN (Statutory Off Road notice) can be obtained by contacting the DVLA. 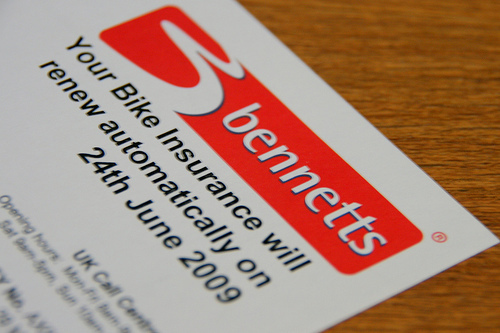 Before making claims for scooters and motorbikes it is worth remembering that the number of claims you file can have a dramatic effect on your future premiums. When filing for a motorcycle claim it is necessary to pay the stated excess, and in many cases this may amount to more than the cost of repairs. In certain situations it may make more sense to pay for repair work before making a claim, so always weigh up your options before making any hasty decisions. One vitally important practice in scooter and motorbike insurance, but unfortunately one which is often overlooked is taking out the necessary safety and security precautions. Just as with cars, it is expected of drivers to keep their bikes in garages overnight as well as installing appropriate alarm and locking systems. Another area within which peoples’ attitudes appear to relax towards motorcycle use, is the subject of additional users. It is never more important to consider who uses your bike, especially those in certain categories such as male or younger drivers which can have a big effect on the price of your premiums. The more people using your motorcycle, the more of a risk you are considered to be with firms offering steeper rates to those statistically more likely to make a claim.